DENVER—Kimpton Hotels & Restaurants has opened Kimpton Hotel Born Denver. Located at the end of the Union Station platform and in the heart of one of the most dynamic urban centers in the country, every detail of Hotel Born—from Bavarian-inspired materials to exposed concrete ceilings, from floor-to-ceiling windows to 700 original works by local Denver artists—has been crafted to impart an elevated, urban vibe that is uniquely Colorado, according to the company. 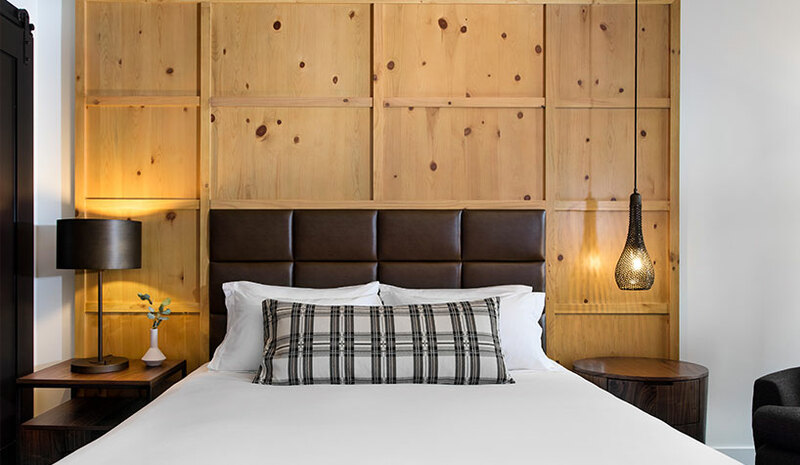 Developed by Continuum Partners, the co-master developers of the Union Station Transit Station, and designed by Denver-based Semple Brown in collaboration with Ellen Bruss of Ellen Bruss Design, Hotel Born has an Alpine modern design. Design elements include a balance of wood, concrete and metal. The exterior of the building reflects the brick masonry of the area’s original historic warehouses. The lobby has knotty pine paneling, custom millwork, and walnut herringbone floors combined with board-formed concrete. Hand-woven rugs, textured materials, warm lighting and unique one-off custom furniture pieces are also included. Hotel Born’s 200 guestrooms—40 of which are suites, including two premier suites with separate living rooms, six-top dining tables, wet bars and free-standing soaking tubs—feature dark brown and gold herringbone patterned carpet and a mix of traditional and modern furniture offset by fresh white walls. The most dramatic feature of the guest rooms are the knotty pine headboards which fold into a ceiling canopy. Each room features large floor-to-ceiling windows. The hotel’s art collection is composed of more than 700 original and limited edition works by Denver-area artists, meant to be integral to the overall design and attitude of Hotel Born. Adam Lerner, director of the nearby Museum of Contemporary Art, asked 32 artists in the city, representing a diversity of styles, to produce bodies of work specifically for the hotel. Approximately 300 works are displayed in the hotel’s public spaces and corridors, while the rest grace the walls of each guestroom. The hotel’s F&B venue, Citizen Rail, offers classic wood-fired techniques and contemporary dining. The wood-fired grill uses both native hard and fruitwoods and serves as the anchor of the exhibition kitchen while Executive Chef Christian Graves’ menu highlights the various house-butchered cuts displayed in the adjacent dry aging room. In addition, Tavernetta By Frasca, co-owned by Master Sommelier Bobby Stuckey and Chef Lachlan Mackinnon-Patterson of Boulder’s famed Frasca Food & Wine, is situated adjacent to Hotel Born and plans to open later this summer. The hotel offers SUV transportation within a two-mile radius of the hotel as well as access to Colorado Athletic Club and the Museum of Contemporary Art. Other amenities will be familiar to Kimpton loyalists such as an onsite fitness center; yoga mat in every room; in-room spa services; complimentary morning coffee and tea service as well as an evening wine hour (featuring local roasters Ozo Coffee and a rotating tap of local craft beers, respectively); concierge services; valet parking; and a pet-friendly environment. A grand staircase in the lobby leads to a second floor offering seven meeting and event spaces encompassing nearly 14,000 sq. ft.